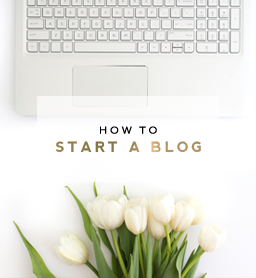 Although I run Designer Blogs and love what I do here, my true passion is nutrition. I graduated from BYU in 2006 with a degree in dietetics and recently received my certification in whole food plant-based nutrition. As a result of my education, I believe very strongly in the power nutrition has in creating, maintaining, and restoring health. Food is amazing and has the ability to help our body perform and function at its optimal capacity if we are nourishing it properly. By simply putting less animal products, processed food, and sugar in our mouths and powering our body with more plants—veggies (including leafy greens), tubers (potatoes, yams, squash, etc. 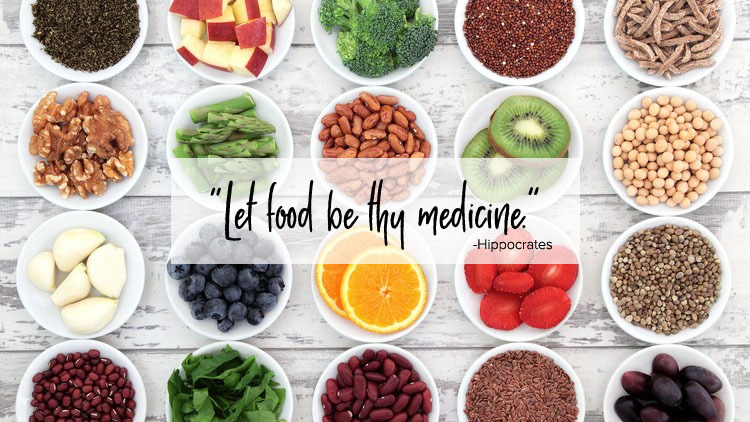 ), fruits, legumes (beans, lentils, peas), whole grains (rice, quinoa, millet, oats, whole wheat, barley, etc. ), nuts, and seeds—we fuel our body with the tools it needs to prevent and even reverse many chronic diseases such as obesity, heart disease, type 2 diabetes, many forms of cancer, and more. I believe that a whole food, plant-based diet is the prescription to optimal health & longevity and I wholeheartedly encourage anyone reading this to learn more about it (links to more info can be found at the end of the post). 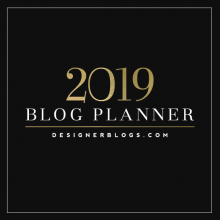 Today I’ll be featuring some of the pages I use most from the My Life Planner—the menu & meal planners and the grocery list—and explaining how I use them to stick to a healthy diet. 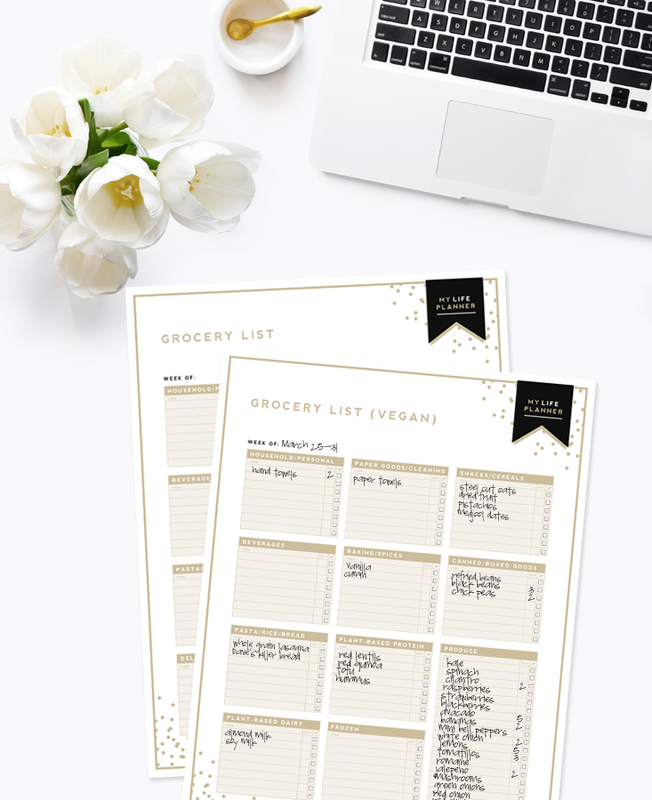 The menu planners and grocery list pages from the My Life Planner have been lifesavers when it comes to planning healthy meals for myself and for my family. 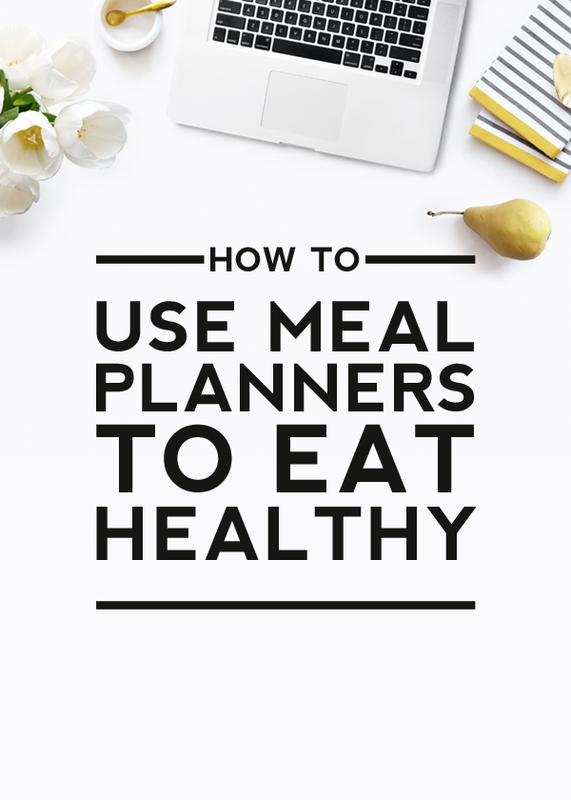 It can be hard to stick to a healthy diet without proper planning and these meal planning pages make it so easy to plan nutritious, well-balanced meals. Taking time to meal plan (for me it only takes about an hour) each week really is the key to eating healthy. When you already have your meals planned out, you’ll be less likely to resort to grabbing fast food or unhealthy prepackaged processed food. Using the grocery list as you plan your meals will ensure you have all the ingredients on hand that you’ll need when it comes time to prep your meals. Scheduling time after a shopping trip to get all of your veggies and fruits washed and chopped for the week can save you oodles of time when it comes to meal prepping. It also makes grabbing a healthy snack easier because everything healthy will already be chopped, washed, and ready to go. 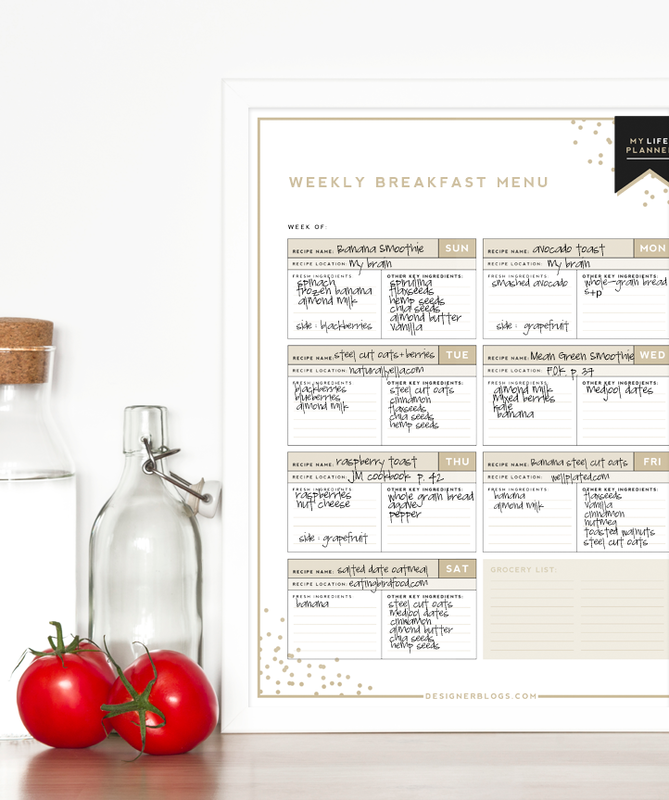 I primarily use the breakfast menu for my own personal meal planning and tend to eat the same set of meals each week. Since my breakfast menu usually doesn’t change, I just make sure I restock any of the ingredients I need for those meals as I make my grocery list each week. Here’s a look at what my current breakfast menu looks like. For lunch, I usually incorporate left-overs from the previous night’s dinner a few days a week as not to waste any food. The other meals listed are my favorite go-to lunches. 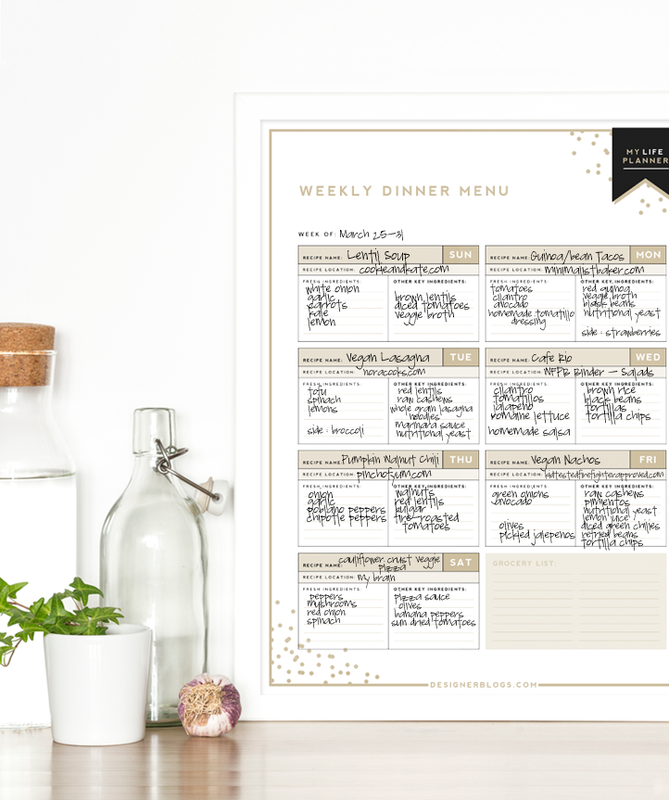 I keep these menus as a permanent fixture in my kitchen so I always have a healthy plan for my meals each day. What’s great about these menus is that it gives you a place to list the recipe location (so you don’t forget) and all of the fresh ingredients for the meal so you can be sure to use all of your produce before it goes bad. You can also list the other key ingredients to be sure you have everything stocked in your pantry each week. Here’s a look at my current lunch menu. My dinner menu contains meals I make for the entire family, so this menu changes weekly as I try new recipes. As I plan my dinner menu (& other menus) I also create my grocery list for the week based off of what I’ll need to make the meals for the week. Setting time aside each week to meal plan and make a grocery list is one of the most important things you can do to stick to a healthy diet. Some of the most important health decisions you make start right in the grocery store. With a pre-made list based off of the healthy meals you’ve planned for the week, it makes it easy to avoid putting unhealthy junk food in your basket. Stick to your list and you’ll be able to avoid temptations. If you don’t bring unhealthy food into your house, you’ll avoid having the temptation to eat it, so just leave it in the grocery store where it belongs. Usually, my weekly shopping haul consists mostly of the fresh produce needed for the meals that week and a few other items that need to be restocked in my pantry and food storage. Because I buy so much produce and eat mostly whole, plant-based foods, I use the Vegan grocery list (even though I don’t consider myself “vegan” per se) because it has more space for produce. 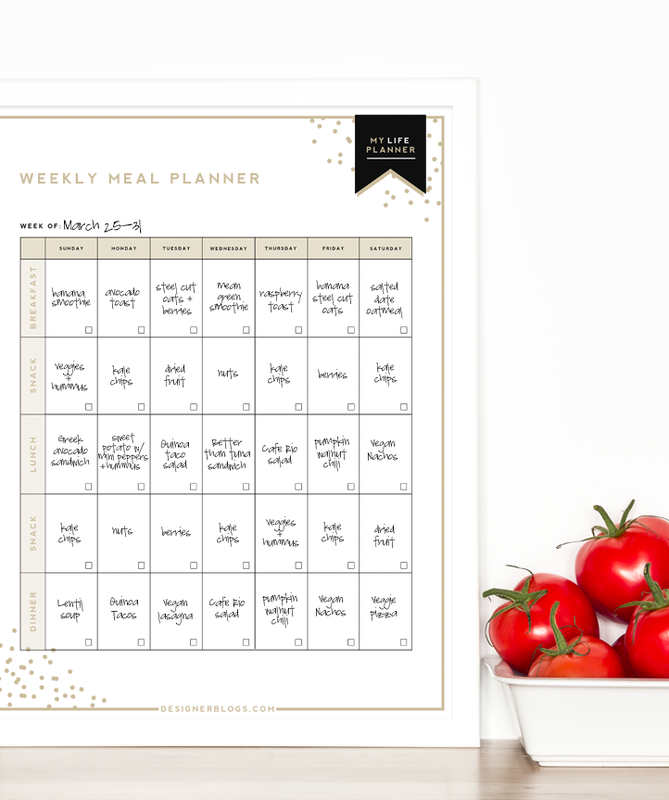 The meal planner is handy because it shows you an entire weeks worth of meals and snacks all on one page. 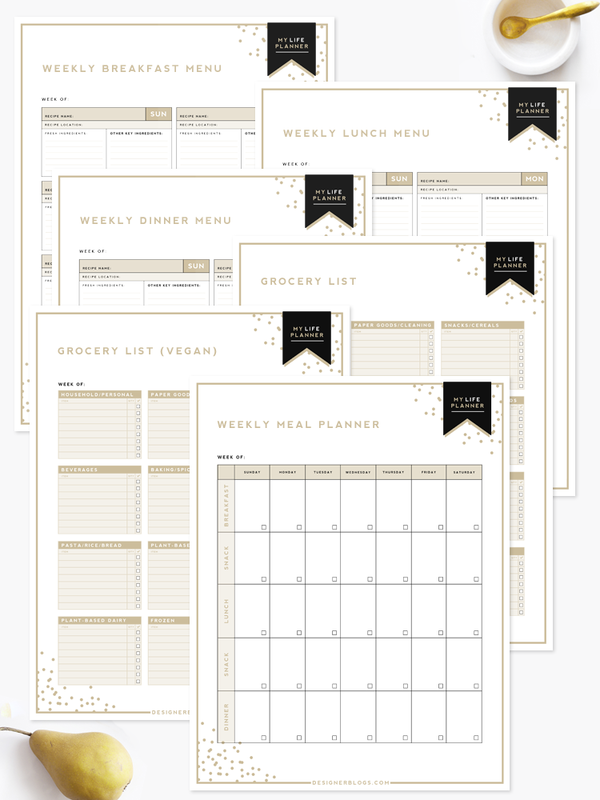 This can be coordinated perfectly with the breakfast, lunch and dinner menus that you’ve already planned from the other pages. 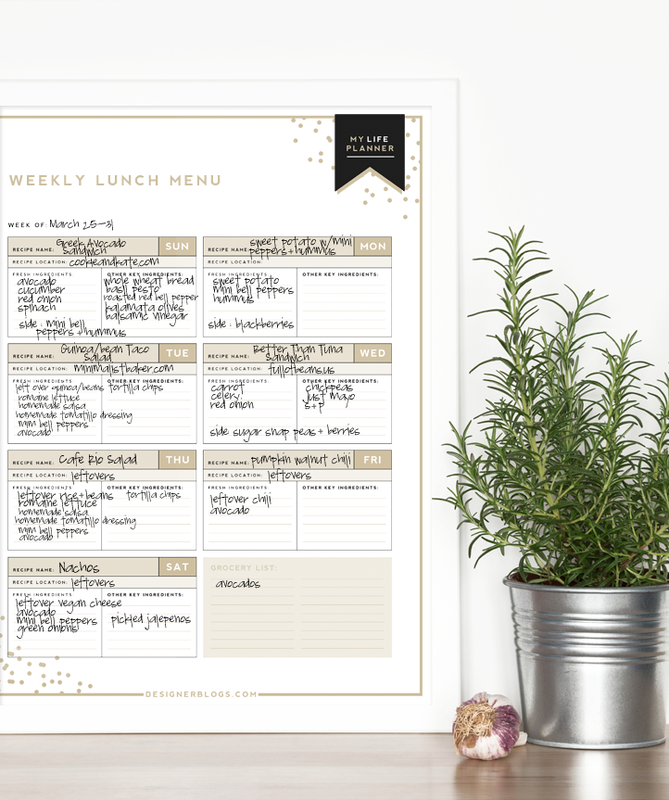 Having everything laid out on a single page helps you see the big picture of your food intake and so you can make sure you are eating a well-balanced diet each day and week. Hopefully this gives you a better idea of how using these pages can help you stick to a healthy diet. Yes, healthy eating takes time and careful planning, but isn’t your health worth it? I’d say it is. 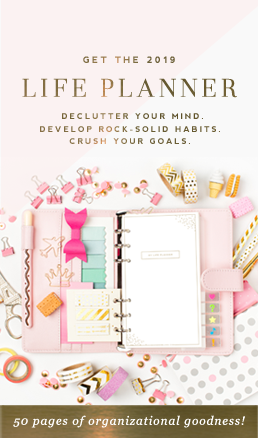 All of the planner pages featured here can be found in our My Life Planner. Watching Forks Over Knives on Netflix. Visiting the Forks Over Knives website here. Reading The China Study, Eat to Live, How Not to Die, & Discovering the Word of Wisdom (for members of the LDS faith). Viewing my Whole Food Plant-Based playlist on YouTube here. Thanks so much or this post, Erin. I’ve had your life planner for a while, but hadn’t really used this section effectively. As you say – it takes time to plan meals properly, and I hadn’t been putting aside that time! My family really needs me to do that. Thanks again for this and all your helpful articles. 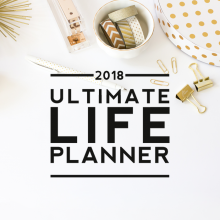 Hi, I purchased your Ultimate Life Planner kit a few days ago and I’m very motivated to begin. But I want to thank you for posting this because you have explained very thoroughly how to use the forms. Thanks so much. I am now looking forward to properly planning. We’re glad this was helpful. 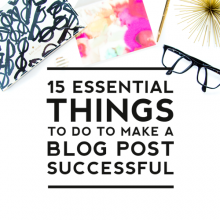 Stay tuned to the blog and our newsletter for additional tips in the upcoming weeks!